Today we will learn about fluid flow. There are many types of fluids which are used in different conditions. The flow of fluid is also as much important as its types because it decide the appropriate application of it. 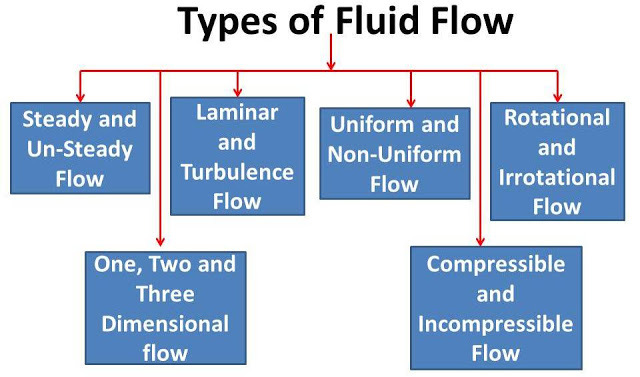 Fluid flow may be classified according to following ways. The flow in which characteristics of fluid like velocity, temperature, pressure, density etc. do not changes at a point with time is known as steady flow. The flow in which characteristics of fluid changes with time at a same point is known as unsteady flow. The fluid flow in which the properties of fluid like pressure, temperature, velocity etc. changes with respect time but does not changes with respect position is known as uniform flow. The fluid flow, in which the properties of fluid like pressure, temperature, velocity etc. changes with respect time as well as with respect position, is known as non-uniform flow. The fluid flow, in which the adjacent layers do not cross each other and move along we define path is known as laminar flow. In this flow, fluid flows along the straight line. The flow in which adjacent layers cross each other and do not move along well defined path is known as turbulence flow. If the fluid particles flowing along stream lines also rotate about their own axes, then flow is known as rotational flow. If fluid particles do not rotate about their own axes, then flow is known as irrotational flow. If the density of fluid varies from point to point in the flow, the flow is known as compressible flow. If the density of fluid remains constant through the flow, the flow is known as incompressible flow. We have discussed about types of fluid flow. If you have any doubt regarding this article, ask by commenting. If you like this article, don’t forget to share it on social networks. Subscribe our website for more informative articles. Thanks for reading it. 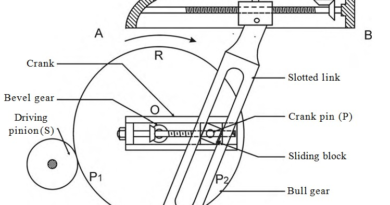 ← What is Bearing? What are Main Types of Bearings?